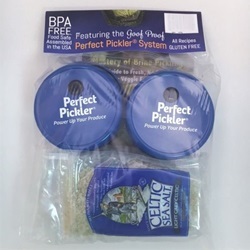 This Kit provides 2 Perfect Pickler® Vegetable Fermenting Systems for easy, do-it-yourself vegetable fermenting. The perfect solution for those who want to ferment more than one jar (or two different recipes) at a time. Foolproof fermenting each and every time. Our Jar top Lids fit onto wide mouth mason jars to create an endless supply of fresh, raw, affordable fermented (pickled) vegetables (enzymes, probiotics and more…) in just 4 days! NO cultures, NO cooking, NO canning. Just add filtered or spring water, vegetables and sea salt (1/4 lb included). Our ClearView AirLock and our NoSpill Gasket (Patent Pending) create an airtight seal to prevent unwanted microorganisms from spoiling the recipe and our Brine ‘Catch’ Cup prevents leaking. Includes recipes and instructions. Domestic and imported parts. Wide Mouth Jar Kit fits ½ pt, 1 pt, 1½ pt, 1 qt and 2 qt wide mouth jars (not included).